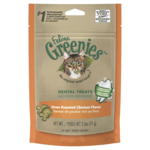 Greenies are the #1 vet recommended dental treat, and for good reason: feeding your cat Greenies every day helps to reduce plaque and tartar build up, freshen breath and maintain gum health. 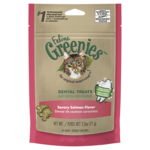 Even the fussiest of felines love Greenies, just one taste and soon they will be begging for their daily fix! For fish fanatics check out Feline Greenies Ocean Fish, Tuna or Salmon flavours, while chicken lovers are sure to enjoy Feline Greenies Oven Roasted Chicken. Got a playful pussycat? 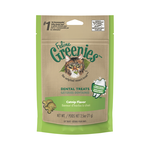 Feline Greenies Catnip Flavour will keep them feeling young at heart.